San Francisco, CA (October 22, 2014) – The Good Food Awards are proud to announce the 206 Finalists of 2015, representing the best from America’s growing movement of talented and socially conscious food entrepreneurs. From Louisiana Swampflower Honey to Georgia Pecan Oil to Colorado Umeboshi, tasty, authentic and responsible food is being crafted in every part of the country. This year’s 1,462 entries—the highest number yet—exemplify the country’s diverse and deep-rooted food traditions. Chosen from amongst the 206 Finalists, 150 Good Food Award Winners will be announced January 8, 2015, at a gala in the Palace of Fine Arts in San Francisco The awards themselves will be bestowed on each winner by renowned chef and activist Alice Waters, who helped launch the Good Food Awards five years ago. The Finalists emerged from a one-day marathon judging session September 7 in San Francisco at the Impact Hub San Francisco, when 180 chefs, retailers, food writers, farmers and food crafters sampled entries from the 11 categories of beer, charcuterie, cheese, chocolate, coffee, confections, honey, oils, preserves, pickles and spirits (including new subcategories for cider, kombucha, yogurt, cocktail modifiers and preserved fish). The top taste scorers were further vetted to confirm environmentally sound agriculture, good animal husbandry, transparency, and fair treatment at all stages of the supply chain. The record number and range of entries reflects the vitality of the Good Food Movement and demonstrates the power of ethical, sustainable food to sustain communities and support local economies. The Good Food Awards are proud to announce a new Presenting Sponsor this year, the Good Food Retailers Collaborative. Composed of ten of the country’s top independent retailers from Brooklyn to Chicago to Philadelphia to Salt Lake City, they are united in their commitment to supporting America’s great food producers both in their own communities and across the country. Joining them is a vibrant group of key supporters, including five-time Premier Sponsors Williams-Sonoma and Bi-Rite Market; and Lead Sponsors Dominic Phillips Event Marketing, CUESA, Impact HUB Bay Area, Veritable Vegetable and the San Francisco Ferry Building. The Awards Ceremony on January 8 will be followed by the new Good Food Mercantile on January 9, a first-of-its-kind trade show where past and present winners and finalists will have the opportunity to exhibit their wares to an anticipated 350 industry buyers. The public GoodFood Awards Marketplace and Beer & Spirits Garden will be held on Saturday, January 10 at the city’s historic San Francisco Ferry Building. There, the 150 winners will offer samples and sell their products alongside the hallmark CUESA farmers’ market, the largest in San Francisco. The Finalists offer a snapshot of how food makers are revitalizing old traditions and crafting new ones throughout the country. Highlights include: Our new honey category brought in a sticky rainbow of entries from flowers we didn’t know bloom on our shores. Our judges’ favorites included New York State Black Locust and Buckwheat Honey from Bees’ Needs, Japanese Knotweed Honey from Bedillion Honey Farm in Pennsylvania, Sourwood Honey from MtnHoney in Georgia, SonoranDesert Bloom Honey from AZ Queen Bee and North Dakota Wildflower Honey from Kloten Apiaries. Brewers are moving beyond fruits and herbs—it seems the latest trend for flavoring brews is native trees! Pennsylvania spruce tips and California manzanita lent flavor to topscoring beers from Philadelphia’s Yards Brewing Company and San Francisco’s own Fort Point Beer. A new subcategory of preserved fish this year brought in new charcutiers working with sustainably sourced, delicious fish, including troll-caught Wild Albacore from Washington’s Island Trollers and Garlic and Olive Oil Preserved CA Anchovies from FISH. Mixologists across the country rejoice! This year’s tasting featured a bumper crop of seasonal, responsibly crafted cocktail modifiers, from North Carolina’srosemarygrapefruit– peppercorn Crude Rizzo Bitters to a Three Chile Syrup from Royal Rose Syrups in Maine to a Spiced Peach Shrub from Republic of Jam in Oregon. Spreadable meats are everywhere. Our judges loved Formaggio Kitchen’s Tongue and Cheek Terrine from Cambridge, Mass., the House Pâté deCampagne from Virginia’s JM Stock Provisions, Wooden Spoons’ Rabbit Rillettes from San Francisco and Market Hall Foods’ Chicken Liver Mousse from Oakland. The Good Food Awards celebrate the kind of food we all want to eat: tasty, authentic and responsible. Good Food Award Winners will be announced on January 8, 2015 in San Francisco. On January 10, 2015, Good Food Award-winning products will be showcased at a 15,000-person public marketplace in collaboration with the San Francisco Ferry Building and the CUESA farmers market. The Good Food Awards Seal, found on winning products, assures consumers they have found something exceptionally delicious that also supports sustainability and social good. Seedling Projects 501 (c) 3 organizes the Awards in collaboration with a broad community of food producers, chefs, food writers and passionate food-lovers. It is led by Sarah Weiner and Dominic Phillips, who have united their diverse skills to support the Good Food Movement. Through focused events and strategic models, it engages the public in finding better ways to feed our communities. Find more information at: www.seedlingprojects.org. 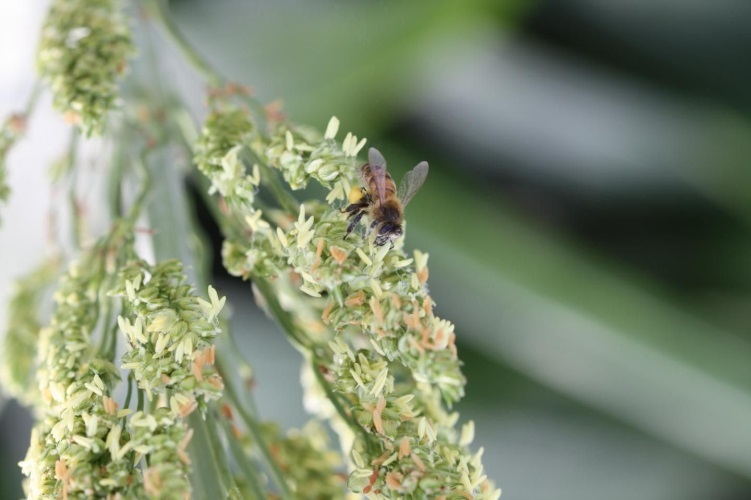 CATCH THE BUZZ – There’s a good correlation between bee health and agriculture according to UT researchers. The University of Tennessee says research shows a positive correlation between bee health and the presence of agriculture – just opposite to popular belief….